I have started to dabble in essential oils. At first, I was unsure how I would use them. I do use them for relaxing and other reasons but my new love is cleaning! Seriously, cleaning. I am all about learning how to clean the house with essential oils. Of course, the first thing I wanted to try was cleaning the toilet. I didn’t have molds so I couldn’t make any fizzies, but I learned how to make a one time use homemade toilet cleaner with items I already had. 5-6 drops of Lemon essential oil – Lemon essential oils are known for their ability to cleanse and purify the air and surfaces. Turning the water off to your toilet, empty as much of the water as you can. I usually flush a few times then using a drinking cup, add more water to make it manually flush again. This will remove most of the water for you. Now you can do this two different ways, and each one works just fine. Option 1: In a large bowl, add your lemon essential oil and white vinegar. Then add your baking soda. When the fizzing starts, dump into your toilet bowl and scrub. Option 2: Sprinkle the baking soda in your toilet bowl. 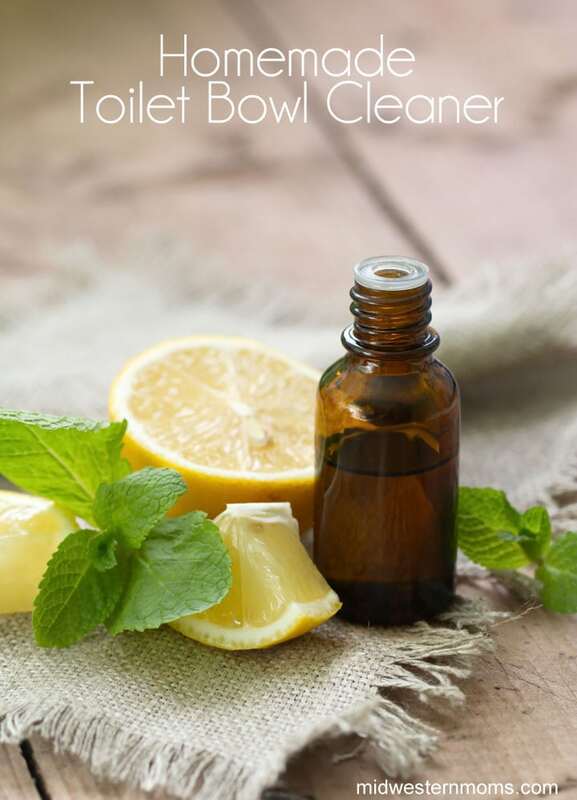 Add your lemon essential oil to your vinegar and pour the mix into your toilet bowl and scrub. Once you are done cleaning, turn the water back on. Wait till the water is full again and flush. This is so simple to do and you already have most of the items in your kitchen. You will be amazed at how wonderful it will smell. This is a great way of cleaning your toilet if you hate smelling the chemicals in your current toilet bowl cleaner. Trust me, once you try it, you won’t go back. You may be interested in my Homemade Mopping Solution for Tile Floors. I also used Lemon for that as well. If you want to know where I purchased my lemon essential oil or if you want to learn how to get your own essential oils at wholesale cost, please contact me. I love learning new ideas for how to use essential oils. I love the idea of making my own household cleaning supplies. That way I know exactly what is in them. You had me til the cup in the bowl ☺️Seriously though. This sounds great and fits right in with my hippie life! You mean where you add the extra water to the bowl? That is just to force more water out of the bowl. Seems odd but it does. Make sure you stay tuned. I will have some more ways to clean with essential oils. Once all my items get here, I am going to try some toilet fizzies. 🙂 Can’t wait! I love this idea! I have never made my own but will try! I would love if you would stop by and share on my Friday Favorites linkup! I linked up. Thank you! I have tried this with tea tree oil (as disinfectant) but the smell was not so great.. gonna have to try with lemon! Tea Tree oil works too. However, I agree, it doesn’t smell that great. You will love them lemon! Thanks for sharing on last weeks Monday Madness! Pop over in a few hours when the new week opens you will be in for a nice surprise! Sounds super easy and not as expensive as the top toilet bowl cleaners! The best part all natural! Thank you for linking up with us at the Tips and Tricks Link Party! Looking forward to see what you link up next! I also don’t understand the cup of water and when are we adding it? Turn off the water to the toilet. Flush the toilet as many times as it allows you. Then, if you add more water to the bowl, it will flush one more time. This will get most of the water out of the bowl. Then go about cleaning the toilet. So basically you need to use this cleaning solution in an empty bowl?